Calling the attention of all the manya—err, Anime lovers everywhere! 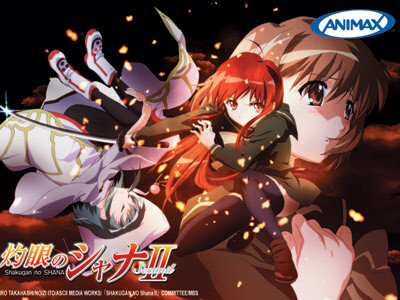 Shakugan no Shana is back at Animax. Picking up from where it left off, the series dives straight into the action where Yuji, a regular bloke who only happens to be the underworld’s most wanted target, pairs up with the extremely hot, flame-wielding Shana, continuing to battle ‘Denizens’ of all forms. But this time, a twist: Yuji’s equally hot classmate, Fumina Konoe, gets into the action. As though a love triangle-ish set up ain’t complicated enough, she gets on with a dubious background; nobody really knows whose side Fumina is on.